James Watson, co-discoverer of DNA’s double-helix structure recently called for a back to basics approach in dealing with cancer. In previous post threads I’ve discussed cancer’s complexity and in particular the confounding and scary implications of somatic evolution, which underscores some of the reasons we are not winning the “war on cancer.” Here I will discuss some cutting edge approaches to treating and preventing cancer and how they might pan out in light of the complexities of the disease. The categories below are not mutually exclusive, and the examples cited are nowhere near exhaustive, but this should give you some food for thought. If you have ideas, questions or know of approaches that should be highlighted, please comment. If, like Aubrey de Grey, you believe that immortality is achievable, or you are just intrigued by the possibility, you should check out this news story on The Methuselah Foundation. 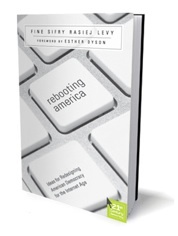 Anyone interested in how technology and policy can work together to form us a more perfect union should read Rebooting America. If your budget is tight right now, you can download the PDF version for free. While you are at it, check out the Personal Democracy Forum which is the larger effort that Rebooting America is part of.